Johanna “Jo” M. Hauptman, age 90, of Hays, KS, passed away peacefully on Monday, January 28, 2019 at HaysMed in Hays. She had resided at Via Christi Village in Hays. She was born on October 23, 1928 in St. Marks, KS, the daughter of Bernard “Ben” and Anna (Zoglman) Landwehr. She was raised on a farm near Fredonia, KS. Jo married Emil Hauptman on May 1, 1954. She was a homemaker and worked as a florist. 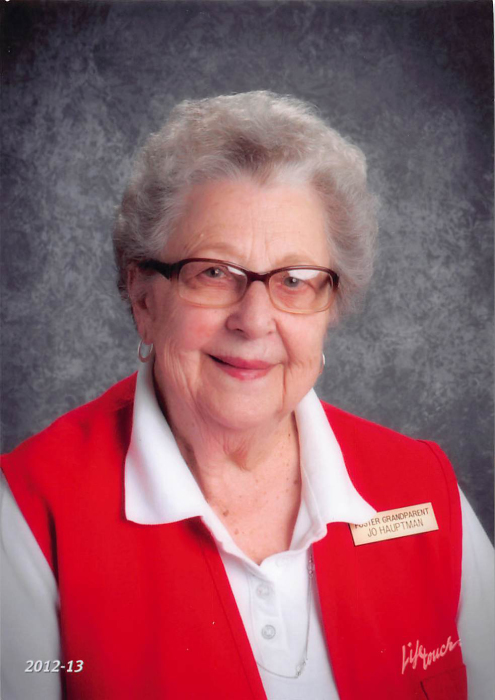 She loved working as a Foster Grandparent at Wilson and Roosevelt Elementary Schools. Jo spent most of her adulthood in Lyons, KS. She loved people, socializing, volunteering and helping others. She had a great sense of humor and enjoyed bingo, playing cards and doing crafts to make gifts for her family. Survivors include three sons, Greg Hauptman and his wife Doreen of Murdo, South Dakota, Mark Hauptman and his wife Jeanne of Hays, Mike Hauptman and his wife Lisa of Topeka; sister, Jean Liebman of Washington state. ; seven grandchildren and eleven great-grandchildren. A Funeral Mass will be held on Saturday, February 2, 2019 at 1:00 P.M. in the chapel at Via Christi Village, 2225 Canterbury Dr., Hays, KS 67601. Burial will follow at St. Joseph Cemetery-Hays.